Product prices and availability are accurate as of 2019-04-14 08:49:39 EDT and are subject to change. Any price and availability information displayed on http://www.amazon.com/ at the time of purchase will apply to the purchase of this product. 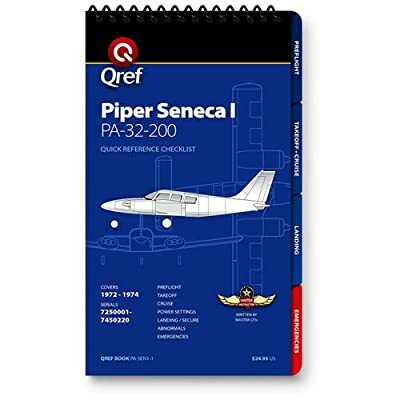 Piston twin pilots who frequently fly the earliest Piper Seneca models will appreciate the superb assembly of operational info contained in this one-of-a-kind, all-inclusive PA-34-200 checklist - though, to be fair, calling a Qref publication a "checklist" doesn't even begin to do it justice. In fact, a Qref booklet is more like a full-color, comprehensive, redesigned, user-friendly, streamlined, upgraded & updated POH/PIM/AFM on steroids. While most manufacturer-produced checklists do follow a logical, streamlined format, at times their setup can be a bit sparse on both nice-to-know and need-to-know info. Furthermore, although aircraft flight manuals (AFMs) contain a host of valuable data, it's often difficult to track down exactly what you're after - despite their industry-wide standardization. With this unparalleled treasure trove of Seneca I-specific info, Qref separates the wheat from the chaff so you'll always know exactly where your sought-after data awaits.Besides delivering logically arranged, easy-to-follow checklists for every conceivable aspect of operation from preflight to shutdown/tiedown - including emergencies - this Qref publication brings users a wealth of additional data unique to the PA-34-200: power settings/performance parameters, conversion tables, ALL V-speeds, weight & balance info, operating limitations, systems specifics, single-engine ops, and even rulers for a variety of common aeronautical chart scales. Plus, its tabbed, spiral-bound pages are all printed in stunning, 2400 DPI color on virtually indestructible sheets! Measures a kneeboard-friendly 4¼" x 7" and covers the Piper Seneca I (1972-74). An extremely intuitive cockpit co-pilot you'll never again want to aviate without.